ENTER TO WIN A $329 lay flat Lake Album from BrideBox! Also check out these PHOTO BOOK (AND MORE) DEALS! Even at this late date, you still have time to execute this idea if you get enlargements made at your local photo print shop or pharmacy, or Target/Walmart-type store and buy frames at your local Michaels or Jo-Ann Fabrics. I have been planning to do this idea for my own family, as we now have a cutie of our own and have tons of great photos of him, but my own personal projects will have to wait until after Christmas. My husband and I will be gifting a whole photo wall to each set of grandparents. What do grandparents love more than lots of photos of their grandchildren? If this isn’t a sure fire gift I don’t know what is! I printed my selected photos on canvas, but you can also frame print enlargements to get the same effect. If you’re looking for canvas deals or print deals, you can find them on my coupons and deals page and on my Groupon page. I decided to do at least four prints for each set of grandparents. For one set: three 16 x 20 prints and one 20 x 24 and for another set: one 24 x 36; one 24 x 24 and two 10 x 10. Size was influenced by three things: the orientation of the photos; the subject matter and the final layout of the wall. To a certain extent you probably could crop most photos into the size you want, but if you’re going to lose too much of the important parts of the photo, you want to make sure you don’t overcrop. For the most part, I left the photos as is and there wasn’t much trimmed off except for the square prints. If you have a large group of people in a single photo, you want to pick a decent size to showcase it or else each person’s head will just be too small. For me, the group family photo was the most important so it became the largest size print (24 x 36). As a rule of thumb from past experience, I want a person’s head (in a large group shot) to ideally be at least one and a half to two inches – if not larger. If it’s not, it might get lost in your wall display. This is especially true if you’re making a canvas print (as opposed to a photo enlargement on photo paper) as the texture of the canvas is naturally rougher and less detailed then an typical photo enlargement. On canvas, the person’s face will be fuzzy if the end size is too small. Also, in a wall display, think about each photo’s relationship to the others. Just as in designing photo books, I always lay out the most important photo first and give it the biggest photo box. The other photos on the page (if any), are intended to complement and support the main photo and are typically smaller. Similarly, I think about which photo is to be the focal point on the wall and make that the largest canvas. The largest one in set two (the 24 x 36) is a portrait of the whole family. I realize that you don’t know exactly how your recipient will intend to hang the photo wall or where they may prefer to hang it, but I recommend you help by showing them the intended layout. After you get the prints, lay it out on the floor and then take a photo of it for them, or you can do a mock layout for them using any number of free online tools and include a print out of that with the gift. I used free site picmonkey.com to illustrate the layouts I designed (not to scale). I didn’t want to show the actual photos as it may ruin the surprise if our family sees this, so these are just sample photos from picmonkey. I’m sure you can see that there is more than one way to hang these groupings. Just as in photobooking, you don’t necessarily have to follow a grid, you could stagger them. Layout 2 can also be more horizontal rather than vertical by moving the bottom three prints as a grouping to the right or left of the top image. For more ideas on wall displays, check out my Pinterest board! DAY 12 – DIGITIZE IT! I’m sure every family has a box of old photos or old photo albums full of treasured memories that have never been preserved in digital form. A great present to give your family is to scan all those old prints and save them on a disc or hard drive. You can make several copies of the disc for everyone’s enjoyment and for safekeeping purposes. You never know when precious irreplaceable photos may be lost in a natural disaster and doing this ensures they can continue to be passed down from generation to generation. The photo disc makes a great gift in itself, or if you have time you can go a step further by making all sorts of photo gifts from them. (Just refer to Days 1 through 11 of this ultimate custom photo gift series!) 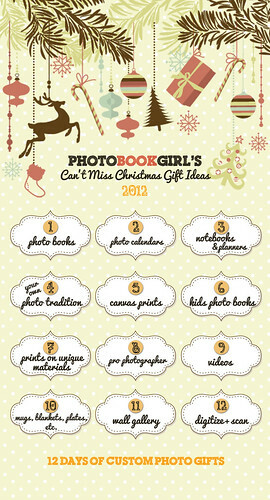 I especially like the idea of creating photo books (of course), calendars or a slideshow. The latter is great for built-in entertainment at your holiday gatherings. You can scan yourself using a home scanner (300 dpi is recommended) or you can pack up your photos and use a scanning service such as this one I saw on Snapfish’s site. For more details and tips check out this post on scanning photos. All twelve days of my custom photo gift guide are up! I hope you’ve gotten some good ideas for your holiday gifts!